They say that if you ascend too quickly you get the bends. They weren’t kidding – as our coach climbed out of Gudvangen it got very bendy indeed. 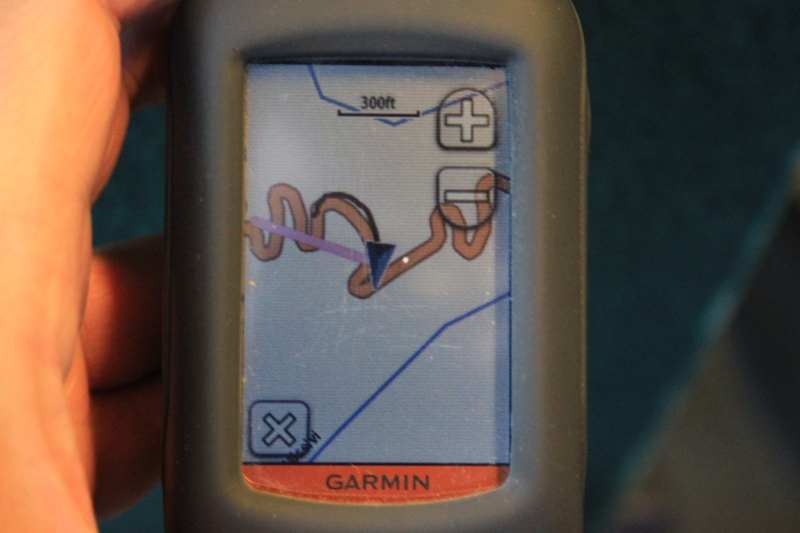 Just look at my GPS! 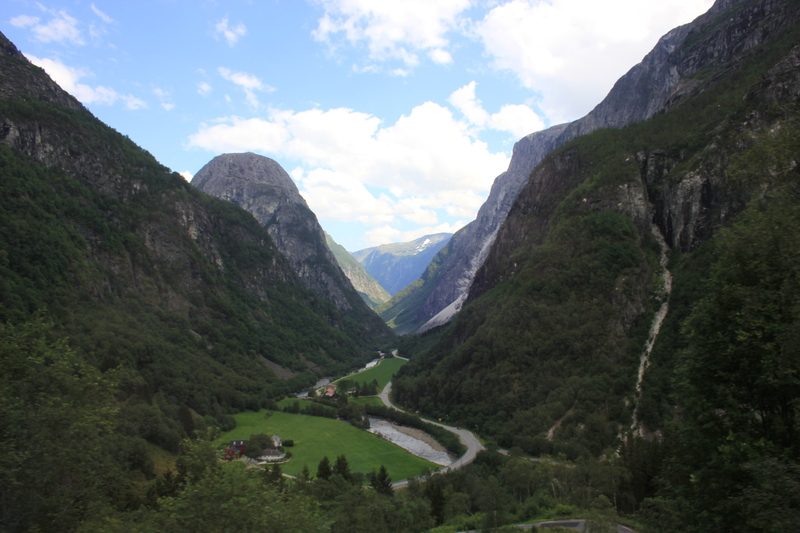 The final stage of our Norway in a Nutshell trip was tourism in its unabashed and purest form. 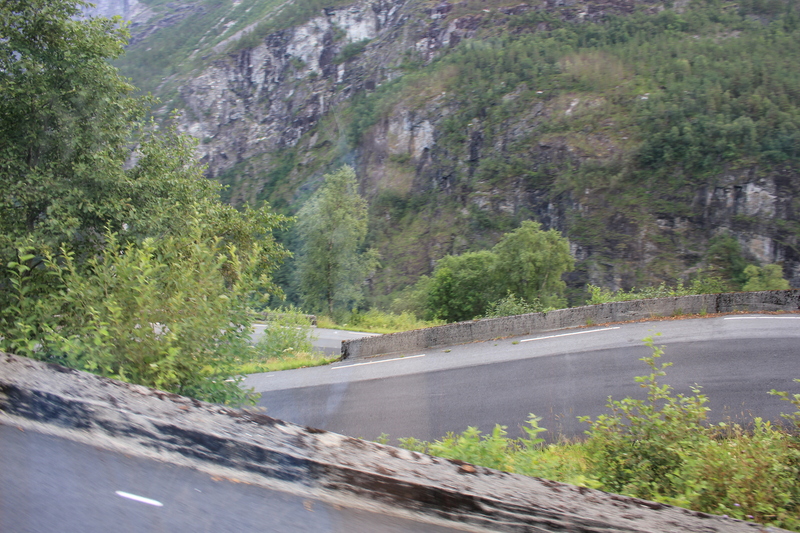 The quickest route from Gudvangen to Voss is by the E16, an arterial route which leads straight from one to the other. But a boring arterial road no good for tourists! Thus, the tour coaches speed along the E16, and then turn off and go back on themselves to take in the Stalheimskleiva. And to be fair it is quite an enjoyable experience which doesn’t take too long. Stalheimskleiva is a half mile stretch of road as the crow flies (and probably six times that in actual distance travelled) that winds its way up from Gudvangen. It was constructed between 1842 and 1846 in order to improve the post road between Oslo and Bergen. At its steepest, Stalheimskleiva is at a gradient of 1 to 5, making it one of the steepest stretches of road in Northern Europe. There are 13 hairpin bends and two waterfalls to see on the way. Our well-practised coach driver made the most of all of them. As our coach made its slow and winding way down, other coaches caught up behind us. Riding in a procession of coaches trying to navigate these bends was actually an experience to be savoured, particularly as there was a car right at the back who had to wait for each and every coach to laboriously manoeuvre around each and every bend. The people in the car were obviously bound for Gudvangen, and there is only one thing to do in Gudvangen – catch a ferry. I hope they didn’t miss it! As for us, we sat back and enjoyed the views. This entry was posted in Norway and tagged coach, gradient, Gudvangen, Norway, Norway in a Nutshell, road, Stalheimskleiva, travel. Bookmark the permalink.